Venom has been panned by critics and loved by audiences and though it isn’t as bad as the critics say it is, with there being a good amount to like as a comic book fan, its shortcomings are very noticeable. Venom is centered around Eddie Brock, an investigative reporter who stumbles onto a story and eventually becomes infused with an alien. He then must both co-exist with this monster and discover the intentions that the entity desires. No matter what he’s in, Tom Hardy brings it with everything he’s got, even when the script doesn’t give him much to work with. The films biggest strength comes from the communication between Venom itself and Hardy, continuously focusing on the interesting dynamic between this savage alien lifeform and the reporter. The action scenes alone aren’t terrible either, with some of them being very entertaining. However, with the exception of the end credit scene, this is the only well-executed part of the movie. This is, I believe, due to studio interference with talks about this film beginning as a rated-R horror movie and turned into a PG-13 action-fest with dark humor. Outside interference should never influence a viewing experience. Unfortunately, when it directly affects the viewing experience is when it must be addressed. Most of the films tone issues derive from the shifting to PG-13 with scenes being poorly edited to conform to its rating, having shots creating a feeling of horrific suspense, only to not go anywhere because it can’t cross too many lines. Deaths of extras, such as biting off people’s heads, are then quickly shot and the body goes off screen, leaving it to feel poorly made. Even the dark jokes feel dumbed down which ruins their execution. The other glaring flaw is the script itself. Going in, I felt a lot of empathy for the actors involved, however, if those same actors have absolutely nothing to work with, no matter how talented, the delivery will always fall flat. The dialogue for Venom and Eddie was great, though it feels like there was a great writer who wrote that dialogue but was then let go and another less talented writer, who had connections to the director, wrote everything else while on a plane to the set. The villain isn’t anything special, being as forgettable as they come. Michelle Williams tries her best as the female lead but the script doesn’t give her anything to work with. The other issue is that she and Tom Hardy have no chemistry together, with Hardy and the symbiote having more of a connection in general. Venom isn’t a bad movie, but it is a dumb movie and if there was an attempt to fully embrace that dumbness, it would have been brought out to be a must-see. 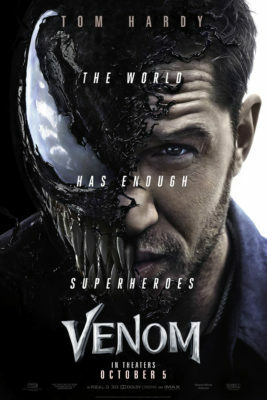 Though as it stands, it only appeals to fans either of the character itself or Tom Hardy but doesn’t leave anything else for the rest of the audience.